The flexibility of the Tekran® Series 3300 Hg CEM systems resulted in hundreds of successful coal fired power plants installations, as well as a host of other industrial emission applications such as cement manufacturing, steel, incineration, pollution control and combustion systems research. Unlike other systems which use atomic absorption (AA) or direct atomic fluorescence (AF), the Tekran® Series 3300 is not cross sensitive to other gases. The unique combination of gold preconcentration, followed by atomic fluorescence detection provides both extremely high sensitivity and outstanding freedom from matrix effects. The independent US research organization Energy and Environmental Research Center (EERC) was contracted by industry and government agencies to test the performance of commercially available Hg CEM systems. This research focused on making measurements in coal flue gas at sub-microgram concentrations (range=0.02-1.06 μg/m3). This reflects the projected mercury concentrations in a MACT regulatory environment where Hg emissions rates will be reduced 90% to 95% of pre-MACT levels. This study showed, once again, that the Tekran® Series 3300 is the most reliable, precise, and accurate Hg CEMs technology available today. The published results of this study can be found by following this link. 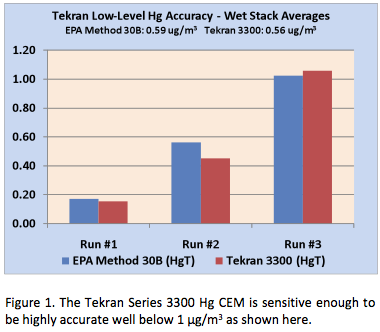 An independent study was completed by Reliant Energy starting in 2006 to evaluate the Tekran® Series 3300 Hg CEM for accuracy at very low Hg concentrations after a FGD wet-scrubber – see Figure 1. The probe used was a Tekran® Model 3342 with a 500 foot transport line. The comparison was made to US EPA Method 30B sorbent traps with acid-digestion and cold vapor atomic fluorescence detection (CVAFS). The results shown in Figure 1 and similar performance measurements confirmed that the Tekran® Series 3300 was the superior Hg CEM system choice. The Energy Research Center conducted an evaluation and comparison study of coal flue gas mercury measurement methods at the Allegheny Energy Armstrong Generating Station in 2006. Two types of coal were fired with concentrations ranging from about 6 to 21 μg/m3. All measurements were compared to the reference ASTM D6784-02 (Ontario Hydro) Method. 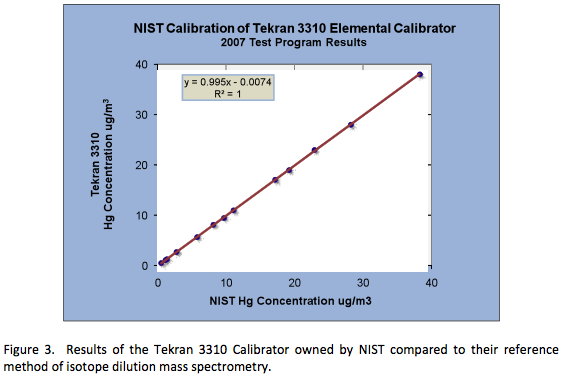 The Tekran® Series 3300 outperformed all other automated Hg CEM technologies with a slope of 0.96, R2 value of 0.99 and a mean bias error of -4.2%. The US EPA conducted trials at two different locations in 2005 to assess the technology available in anticipation of an emission regulation for coal-fired power plants. The trials were conducted on two very different sources. Tekran® was the only CEM technology that was able to pass the testing criteria and the relative accuracy testing (RATA) in actual flue gas. Although these results are no longer new, they show that Tekran® had superior performance early on as a result of our unique features and design. The US EPA purchased 3 full Tekran® 3300 Hg CEM systems from Tekran® after these trials were completed. The full reports are available from the US EPA.